We got some more good news out of Case-Shiller this week, but we were quick to be warned not to get too excited. I swear, will it ever be Miller Time? Dallas-area home prices rose a record amount in June, 8% over last June, but rising mortgage rates, the growing mess in Syria, and economic QRM”ick” could end our appreciation party. What Standard & Poor’s/Case-Shiller Home Price Index told us Tuesday: prices for Dallas-area single-family homes, pre-owned, not newbies, increased 8 percent in June from a year earlier. Dallas is one of the few places in the country where prices have surpassed their pre-recession peaks. That was below a national increase of 10.1%, because, remember, our market never went as bust as others did. So the fact that we were below the national average — by a lousy 2 points — is no biggie. D’Ann Petersen of the Dallas Federal Reserve says our home prices are less volatile than U.S. prices, and we are seeing larger than average price gains because sales are so strong. The median price of a home in Dallas is now about $181,000, up 11.5% from a year ago. Affordable? Yes, but nudging higher to $200,000. Maybe that’s why earlier this month, Trulia.com put Dallas on a list of the nation’s 10 most overheated housing markets. Trulia chief economist Jed Kolko said Dallas homes were overvalued by 4 percent, but he also sees a cooling-off period, and he was more concerned about Midland where you cannot even get a HOTEL ROOM. Other experts, like IHS economist Erik Johnson, says U.S. housing inventory shortages will only get worse. So there is this ying and yang: mortgages inching up, the future demise of Fannie Mae and Freddie Mac, but fewer homes to choose from. Looking at the list, you can see how cities hit the hardest during the bust made the biggest leaps up in values. Vegas is looking hot again, and in fact, I’ve heard jobs in Vegas are opening up. Home prices jumped 24.9 percent in Las Vegas, 24.5 percent in San Francisco, and four other cities — Atlanta, Los Angeles, Phoenix and San Diego — saw prices rise 19 to 20 percent. Dallas and Denver are the only cities in the index to hit an all-time high in June. Dallas posted smaller real estate gains for June than for May. Dallas home prices rose 2% from April to May, but only 1.7% from May to June. June is usually a huge real estate transaction month, but I suspect the market has been so frenetic since January, it ramped out June sales to earlier months. Inventory also continues to be a problem. Good news is the number of foreclosed houses for sale in Dallas is down more than 30% in June, measuring from the worst foreclosure period of the recession, this from CoreLogic Inc. Good news for the economy, bad news for some mortgage companies and law firms. It was low interest rates — and jobs — that jump-started homebuyers starting in January 2013. But the supply of homes for sale has not been able to keep up with demand, driving up prices. And interest rates are inching back up, oh so very gradually, getting closer to 5%. It would take interest rates to jump up to 7% before some people felt knocked out of the market, someone in the mortgage world told me this week, but still that inventory void could keep values up. Home prices: He sees high single-digit price appreciation starting next year and returning to more “normal” affordability levels in 2016 or 2017. 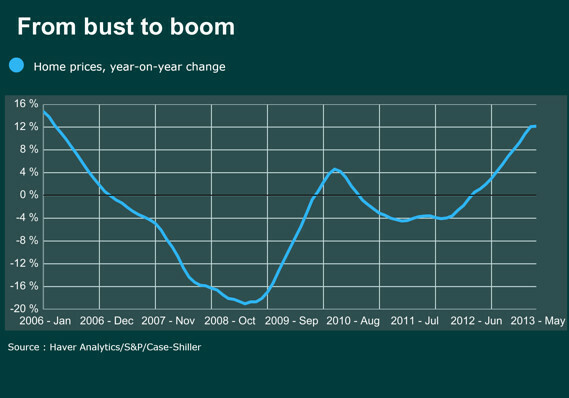 Home prices will rise 10 percent to 11 percent this year, 6 percent in 2014, 4 percent in 2015 and 1 percent in 2016. Homebuyers: Entry-level home buying is slowing because the most qualified buyers already have bought, not because of rising mortgage rates. High multiple car payments are keeping some people from qualifying for a home mortgage. Apartments: Ten major U.S. cities have a high supply of apartments, including Austin, Dallas, Houston and San Antonio. More apartments than single-family homes are being built in Austin, Burns said. U.S. housing permits: Burns expects single- family housing permits will grow to 805,000 and apartment permits will rise to 436,000 in 2014 — still below historical levels. I like this Burns guy. Apartment construction is out of control. Agree on first time home-buyers: first the Obama administration embraced them with a first-time homebuyer’s credit, now it’s saying “screw you” as it prepares to dismantle Fannie Mae and Freddie Mac. After all, it was Bill Clinton who, in 1996, decided that everyone deserved a home whether they could afford it or not. Kind of like how President Obama thinks everyone deserves health care. October will be a very interesting month.